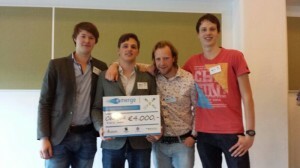 Great news: four BSc students supervised by Roel Kuiper and Jeroen Wildenbeest have won an award! Ward Heij, Wilco Vreugdenhil, Leroy Boerefijn and Marijn Flipse have been working very hard for their “Bachelor Eindproject”, which involves the realization of a 1 DOF master-slave system, used to experimentally investigate the interaction of haptic shared control and transparency for an abstracted force control task (turning a bolt). Their hard work (and that of their two supervisors) was recognized with a check of 4,000 euro, intended to further improve the device and experimental setup: the Gemini.